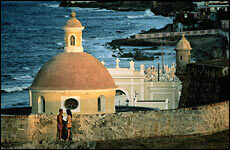 A couple stands in front of an old cathedral on San Juan's rugged coast. Puerto Rico is a place of many pleasures: miles of Caribbean coastline, rugged mountains, cities and towns of irrestible charm. "The Princess of Spain is comingyou have to stay for dinner." Manuco Gandía stood in a tuxedo in the foyer of the Galería San Juan, addressing me and, like any good hotelier, keeping an eye on preparations for the reception. "We want some of our friends here." I was across from the old San Juan Cathedral, taking a photograph of the Caleta de San Juan, a cobbled lane of pastel-painted town houses and flowering trees that must be one of the prettiest residential lanes in the Americas south of the Tropic of Cancer. In the square opposite the church, an old woman in a faded dress and torn stockings was filling saucers with milk for a gang of feral cats. "These cobblestones were brought here by Columbus," she told me. "By Columbus himself!" I said, trying to convey a tone of belief. "Yes! All the way from Spain by Colón himself!" I learned later that a few of those stones had indeed come to the island as ballast on Spanish ships, although the Italian adventurer didn't have time to pave the streets of San Juan single-handedly. But Puerto Ricans are so proud of their island that some of them can't help embellishing a bit. Take the graduate student who guided me through the San Juan Museum of Art and History's magnificent presentation of Puerto Rican culture. He suggested that Puerto Rico not be measured merely by the stature of its tallest peak, 4,390-foot Cerro de Punta, south of Jayuya, but instead, perhaps, by the island's rise from the bottom of the ocean. "Puerto Rico, you see, is actually the top of a submerged mountain, so its true height rivals that of the Himalayas." Well...why not? Puerto Rican chauvinism, like parental pride, is not to be challenged. And the fact is, Puerto Rico, a semi-autonomous, internally self-governing U.S. territory, is an extraordinary islandan area smaller than Connecticut, mostly mountainous, with some 300 miles of coastline scalloped by soft sand beaches and lagoons easing into warm tropical water. Inland, rolling coastal plains rise abruptly into the Cordillera Central, a densely forested mountain range running parallel to the island's length and creating an unusual mix of climatic zones and ecosystems. Add an appealing assortment of restaurants; hotels and resorts from offbeat to grand; some of the oldest, most historically significant architecture in the Americas; world-class museums of art, history, and cultureand you have what the French historian Guillaume Raynal assured his king in 1780 is "one of the best islands and perhaps in proportion to its size the very best island of the New World." I thought back to Jan and Manuco's party at the Galería the night before. (Despite my rudimentary Spanish, I had gotten through the affair without embarrassment thanks to Manuco's mother, who had deftly switched the table's conversation to English whenever she caught me nodding a bit too automatically.) After dinner, I'd climbed to the Galería's roof deck to scout the old lookout's 360-degree view. The city was quiet, its indigo cobbled streets as softly lighted as they must have been in the early 1800s, when its streetlamps burned oil. To the west, floodlights illuminated Fort El Morro, Puerto Rico's unofficial trademark, its mottled stone walls, 40 feet thick in places, rising 140 feet above the sea. The old redoubt is one of the largest intact Spanish colonial fortresses in the New World. To my mind it's a symbol of the extent to which this strategic Greater Antilles island, roughly 35 miles wide by 110 long, fourth largest in the Caribbean, has been coveted by four different nations at one time or another for over 500 years. The Atlantic was luminous in the moonlight, its surface streaked by the northeast trade winds that carried Christopher Columbus on his second voyage to the New World in 1493. He landed somewhere on the west coast and found villages of thatched-cane houses, but no sign of the farmers and fishermen who later introduced themselves as Taíno and called their island Borinquen, the "land of the brave Lord." Columbus christened the isle for Saint John the Baptist and three days later sailed away. One of his lieutenants, Juan Ponce de León, returned in 1508 and claimed the island for the Spanish Crown, which coined the name Puerto Ricothe "rich port." It was time to explore the treasures of this "rich port" beyond historic San Juan, so I rented a car and set out on a clockwise journey around the island. The trade winds that brought Borinquen's destiny from Iberia were whipping up whitecaps when I arrived in Loíza, a coastal community about 15 miles east of San Juan. Its narrow streets were filled with schoolchildren on their lunch hour, many of them wearing parochial-school uniforms. Their similarities ended there, however, for in their hair (sandy blond, brown and straight, black and curly), their eyes (gray, blue, and brown), and their skin (freckled porcelain, café con leche, and the purest ebony), I saw evidence of Puerto Rico's historical bloodlines: Indian, Spanish, Dutch, English, French, and, here in Loíza especially, West African. Slaves were settled here in the early 1500s to work on the sugarcane plantation that founded Loíza. After Spain abolished forced servitude in 1873, many of Puerto Rico's freed laborers continued to work in agriculture, gradually assimilating into the colonial culture. But Loíza, isolated by a piney forest and a vast mangrove swamp, felt much less of San Juan's European influence and evolved a peculiar blend of West African and Spanish-Catholic ruralism that blooms every July during the weeklong Fiesta de Santiago Apóstol, when thousands of islanders come to watch bomba dancers and revelers wearing vejigante masks, grotesque faces carved from coconut shells, raise dust to the staccato beat of wooden drums. Walking around town, I passed cottages painted bright blue, red, yellow, and green, and saw a woman walking along the road wrapped in a beautiful red-and-gold African fabric, a plastic bucket balanced on her head. Searching for a place to buy a soda, I ducked under the sagging porch of what looked to be a café and was startled by a wall of vejigantes making faces at me. Originally they were intended to frighten the irreligious back into church; now the intent is to have fun. The shopkeeper swung his arm around to present them like a lineup of beauty queens. "Bring good luck!" he assured me. We chatted in bits of English and Spanish, shook hands, and wished each other well. Although you can usually find your way to a beach without great difficulty, a good portion of Puerto Rico's enticingly beautiful and wild coastline, embroidered with offshore cays and coral reefs, is made inaccessible by mangrove shallows, swamps, and cactus forests. Near Luquillo, on the northeast coast, I set out to reach a vivid turquoise lagoon by wading through a spooky mangrove swamp, but before long had visions of being found after the crabs had finished with me, and lost my nerve. It turned out that all I had to do was walk the half-mile boardwalk at the Las Cabezas de San Juan Nature Reserve, a 440-acre sampler of these exotic, salty ecosystems. After that I found my way up to the observation deck of Las Cabezas's neoclassical lighthouse, where I watched migratory seabirds, graceful as trapeze artists, diving into the sea, which abounds with tarpons and myriad other species of fish and crustaceans. That evening I left the natural world for Fajardo, on the east coast, and a place where you need not be the fittest to survive. At the El Conquistador, one of Puerto Rico's best-known luxury resorts, the guest reclines at the top of the food chain, with a read-your-mind-and-do-it-for-you staff of around 2,000 people lined up below. I was given a map to find my way around, and I needed it. El Conquistador's 900-plus rooms are divided among four areas on a 300-foot-high headland. The resort has its own marina, where I caught a water taxi out to hundred-acre Palomino Island, a private paradise where guests can ride horses, swim, scuba dive, parasail, hike nature trails, order up a massage, or simply loll under a shade palm. While I was doing the latter, several fellow leisure mavens galloped past on horses. Smiling, hair blowing in the breeze, they reminded me of people in shampoo commercials. I felt more in touch with the island a day later, walking a trail through the soggy evergreen tangles of the Sierra de Luquillo, west of Fajardo. Here mountains rise steeply over 3,000 feet, ramping moist Atlantic winds up into cooler zones and perpetuating a rain cycle that dumps over 200 inches of water annually on the 28,000-acre Caribbean National Forest, the only tropical forest in our National Forest System. The Taíno called it El Yuque (which has become El Yunque), some say after their god Yuquiyu, whom they believed watched over them from his throne high up in the "cloud forests." I followed a stream up an emerald ravine, the light diminishing as the overgrowth closed in. The shriek of parrots echoed from far back in the forest. Ferns and exotic plants taller than I burst from the mossy slopes, green explosions detonated by the rain forest's astonishing vitality. About an hour later, the trail ended in a piney glade. A fog hung in the cool air. I sat there for a long time in a silence measured by the steady pat of water dripping from the evergreen canopy. It was a perfect place that needed nothing, except to be left alone. "The romanticthat was what I wanted." So wrote the young adventurer and travel writer Richard Halliburton in 1925. A restless Princeton student about to graduate, he "wanted to lie on a surf-swept beach and fling monkeys at the coconuts." I thought I'd like to find a version of the same thing, and I did, at the Caribe Playa, a modest, friendly little resort between Maunabo and Patillas on the southeast coast. On the open-air terrace there I dined on asopao de camarones, a spicy, garlic-laced stew of rice, vegetables, and shrimp, then took a humidity-swollen paperback thriller left by a prior guest down to the beach and fell into a hammock. There were plenty of coconuts, but no monkeys to throw at them, so I read a few pages, decided that existentially weary spies are real beach-party poopers, tossed the book, and let the splash of waves and the breezy scuffle of palm fronds tell tales of conquistadors sweating under iron helmets and breastplates as they thrashed up into El Yunque in search of gold. When I woke up it was dark. I thought about sleeping outdoors in the hammock, as Halliburton would have, but the mosquitoes buzzing my ears convinced me to retreat to my room. Ponce, on the south-central coast, was my next stop. This lively city wants to be Puerto Rico's capital, and, to all appearances, carries on as if it already were. Its modernistic Museo de Arte is the Caribbean's preeminent showcase of European, Puerto Rican, and American art, boasting an outstanding collection of 19th-century pre-Raphaelite paintings. The Teatro La Perla, on Calle Cristina, has been the south coast's performing arts center since its debut in 1864, and the Tibes Indigenous Ceremonial Center on Ponce's northern outskirts is one of the Caribbean's most revealing archaeological sites, with a museum tracing the evolution of the seafaring South American tribes who settled the island. Ponceños are accused of being snooty about their city's refinements, but I can't blame them. Ponce came into money in the mid-1800s as an agricultural and shipping center for sugar. The boom, later fueled by coffee, lasted some 40 years, and much of the wealth flowed into a remarkable collection of neoclassical, rococo, and criollo buildings (the latter a wood-and-masonry style blending architectural elements from Spanish Revival to Victorian). Many of these structures are located in the city's old section around the Plaza Las Delicias. What preserved these confections, ironically, was the bust that followed the boom. During the Depression in the 1930s, the sugar and coffee industries lost their vitality, Ponce's shipyards closed down, and development ceased. The same circumstances froze the southwest city of San Germán in time with the same bittersweet result: The city's 36-acre historical district holds nearly 250 architectural gems listed on the National Register of Historic Places. During the coffee boom, I suppose a lot of people in San Germán considered themselves blessed, and I imagine many came down to the Plaza Santo Domingo to climb the redbrick steps to Porta CoeliHeaven's Gatein the hope of eventual, even greater rewards. Heaven's Gate is a simple chapel founded in 1606 by Dominican monks; it's said to be the second-oldest church under the U.S. flag. It is still a sanctuary for saints, mostly wooden onescarved and hand-paintedand paintings illustrating the faith that set the saints apart, some of them among the rarest and finest examples of ecclesiastical art on the island. When I arrived at the portal, however, Heaven was closed for the lunch hour, so I sat on the steps to study a walking-tour map of the city and then set out to enjoy San Germán's assortment of criollo buildings, still mostly private residences. I was becoming addicted to a morning jolt of the very strong coffee (once so prized in Europe that it was served to the Pope) that paid for all this fine architecture. I kept hearing stories about the town of Utuado in the Cordillera Central, one of the island's famed coffee centers. Coffee is still grown near Utuado, where the distinctive brown-and-white government parador signs guided me through a maze of jungle intersections to the parador Casa Grande, once a coffee plantation. That evening after dinner on the terrace of the inn's main house, I had my first cup of the stuff, so rich it was nearly black, yet smooth and without a trace of bitterness. "Pretty terrific, no?" My host, Steven Weingarten, refilled my cup and then his own. We sat on the porch, listening to jazz CDs and an occasional sploosh from the swimming pool as the sun's shadow climbed the precipitous valley enclosing the inn. It was the coffee that made me demand to know how Steve, a lawyer with a good practice on Long Island, and his wife, Marlene, a court reporter, ended up owning a parador in the jungle. "We came here, loved it, got to talking about what we'd do if we owned it." Maybe it was the coffee that made them tell the owner they wanted to buy it, and maybe it was the coffee that made him agree to sell it. "Next thing you know...."
Not everyone, I found, appreciates the parador tradition of country inns, which are scattered throughout Puerto Rico. They're often rustic, and in the case of an old plantation this can mean concrete floors, tin roofs, and some very basic plumbing. Think of summer camp, with a lot better food and no bullies. "This is a mountain retreat," Steve observed, "where you come to read, swim, hike in the jungle, visit local towns. The luxury is in the simplicity and the peace." Just before I'd embarked for Puerto Rico, I'd read a letter to a national newspaper in which a traveler had expressed dismay at having to share his parador room with reptiles. Well, fine. There were reptiles in my room that night. Two of them in factfive-inch-long lizards that behaved perfectly. And all night long outside my room in the renovated workers' quarters at La Hacienda Juanita, another charming old coffee-growing estate, near Maricao, dozens of thimble-size coquí frogs repeated a two-note piccolo-pipe question that sounded like Tinker Bell asking in French-accented English if I wanted a "ko-kee?" It's easy to come to Puerto Rico, oil up, stretch out on a beach, and let people serve you cookies. Or lounge the evening away on the terrace at a resort. Or escape to a parador. But I also kept going back to the natural places, and so should youlike to the scrub and mesquite thickets of the 1,620-acre Guánica Forest Reserve close to the coastal hamlet of Guánica. One of the world's last remaining dry forests, its dusty trails led me down across sun-baked hillside dreamscapes of stubby and contorted gumbo-limbo trees, rotund melon cactus, and guayacán, a steel-strong wood once used for the masts of Spanish and Dutch warships, so dense it sinks in water. If you are not claustrophobic, drive inland from Arecibo to Rio Camuy Cave Park, where the world's third-longest known subterranean stream has created a sinkhole deep enough to swallow a 30-story building and carved underground chambers half a mile long and 170 feet high, haunted by weirdly shaped limestone accretions, falling water, and columnar stalagmites rising 30 feet. You won't forget itever. There is much I will never forget about Puerto Rico, with its history-rich cities and towns, welcoming resorts and inns, and bounteous natural wonders. I carry in my mind an album of ineffably pleasant momentsceiling fans spinning late on a humid night in a restaurant in Old San Juan; a window open to moonlight on the Caribbean; standing in the middle of a Taíno ball court on a silent afternoon near Ponce, imagining the dust and laughter of a game played almost 1,000 years ago; a 200-year-old window shutter creaking in a warm afternoon trade wind. I remember a sky full of kites fluttering above the green of El Morro Fort, and proud old men in straw hats sharing park benches and talking politics. I remember rounding a curve in one of the poorest regions of the Cordillera Central and passing a rude shack where a young woman of striking beauty sat on the steps in a faded dress, barefoot, her chin in her hands, gazing off across the valley with a wistful expression that hinted of wonderful, impossible dreams. I look at the vejigante snarling at me from the wall of my office and I remember the voice of the vendor in Loíza: "Bring good luck!" Let's start with getting me back to Puerto Rico.